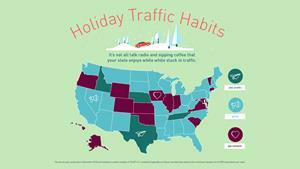 New Zipcar survey reveals how travelers pass time in holiday traffic. BOSTON, Nov. 19, 2018 (GLOBE NEWSWIRE) -- ‘Tis the Season... for holiday traffic! As millions of Americans hit the road and traffic increases between now and the new year, Zipcar, the world’s leading car-sharing network, conducted its annual survey to determine how travelers pass time in holiday traffic. As expected, the top answers include looking for a quicker route and singing along to tunes: More than two-fifths (44%) turn up the music loud and proud and one-quarter (25%) simply seek a shortcut. But, some of the more interesting things going on behind closed car doors? When really stuck in traffic, 62% of respondents turn to gossip, 28% turn up the heat and get romantic and 10% prank their co-pilot. Texas may be the biggest continental U.S. state, but it’s not the biggest mouthed. Utah is four times more likely to gossip than Texas; and Michigan is three times more likely to gossip than Virginia. Looks like southern manners may be real. The states most likely to pull over for some mountainside romance? Utah and Colorado. Least likely include Georgia and Mississippi. Acting as its own “comedy central,” New Yorkers are the most likely to pull pranks on their co-pilot; Michigan passengers are least likely. South Dakotans and Georgians are twice as likely to call someone important over those in Maine and Oklahoma. Wonder which states have the happiest moms? Looking for the best shortcut? Phone a friend in New Jersey. More than 1/3 of people in the Garden State search for a shorter route at first break light sight (nearly 10 points higher than the national average). Zipcar provides on-demand access to cars by the hour or the day in cities and college campuses across the globe. Reserve a car in seconds via the Zipcar website or mobile app for holiday shopping, errands, road trips and more. The survey was conducted in November 2018 and included a random sample of 10,079 U.S. residents (regardless of Zipcar membership status) with a minimum sample size of 200 respondents per state. Zipcar is the world’s leading car-sharing network, driven by a mission to enable simple and responsible urban living. With its wide variety of self-service vehicles available by the hour or day, Zipcar operates in urban areas and university campuses in over 500 cities and towns across Belgium, Canada, Costa Rica, France, Iceland, Spain, Taiwan, Turkey, the United Kingdom and the United States. Zipcar offers the most comprehensive, most convenient and most flexible car-sharing options available. Zipcar is a subsidiary of Avis Budget Group, Inc. (Nasdaq: CAR), a leading global provider of mobility solutions. More information is available at www.zipcar.com.